Would you wear jeans and Tevas on a half-marathon? Probably not. 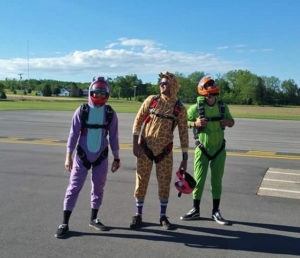 You might, however, think that what to wear skydiving is the same stuff you’d rock to a roller coaster ride. Totally common mistake. But no worries – we’re here to help set you straight. These are our best tips for successful wardrobe choices on a skydive – whether the weather’s chilly wintry or sultry summery. 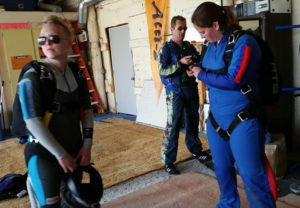 Solid shoes and a jump suit make sure you’re comfy on your skydive. Start from the ground up: The right shoes are key. Comfortable supportive shoes that lace tightly are the best choice. Make sure too they’re tied nice and tight when you jump – otherwise, the wind will snap them up and redecorate the landscape with them. 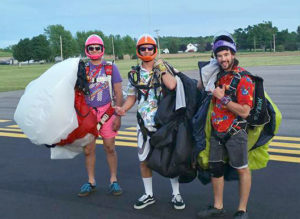 Simple skydiving clothing is the best skydiving clothing. Avoid fancy details and anything that flaps around, as those loose bits have a tendency to whack around painfully and/or tie themselves in a knot. No jewelry is a no-brainer. If you decide to jump when the weather is cold, be warned: When it’s chilly on the ground, it’s really chilly at altitude! That’s because temperatures up top drop about thirty degrees below the temperature on the ground. Brrr! 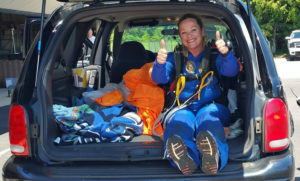 Luckily, there’s good news: pumping adrenaline tends to keep new skydivers from noticing – and you can help out mother nature by choosing skydiving clothing that sets you up for a toastier experience. Dress in lots of thin layers. It’s almost magic how much warm air thin layers retain. (That’s because they sock it away in the air spaces in-between.) Forego one awkward thick layer for several thin ones, and you’ll be significantly comfier and more agile up there. Maybe go for a jumpsuit. You can borrow one of ours and pop it on over your shorts and tshirt. The suit helps to protect your own clothing (and skin) against dirt and damage upon landing. Also: It looks pro in your videos. Sweat is probably going to be a thing. (This is a sport, remember?) If your plans include going someplace after the jump that you wouldn’t happily walk into straight from the gym, you’ll be happy you brought a change of clothes to pop into. Fun Onesies are not a bad choice for the experienced jumper! When you’re choosing what to wear skydiving, remember: When you make that jump, you’re trying out a new sport. Aim for clothes that are comfortable, able to move and buildable layers-wise. With that framework in place, you’ll have a super-comfy jump and landing, no matter the weather! As you get more experienced and figure out what works for you, there’s also no reason to abandon fashion or fun – experiment with outfits like warm and fuzzy Onesies, or rock your favorite Hawaiian shirt. Finally head on over to our Planning Your Day page to get more useful info for your jump, check out our facilities, or pop on over to book your skydive now!